Thursday was flu shot day for me. This year, I went to CVS Minute Clinic instead of getting my flu shot at work. Hospital policy makes it mandatory that all employees get a flu shot so that we do not expose our patients to the flu. 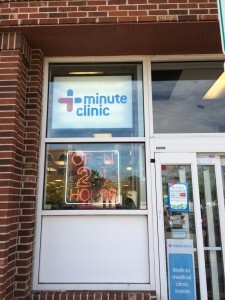 Minute Clinic was a new experience for me. Since my family is in the medical world, it has always been easy for me to drop by my doctor’s office for a quick shot in the arm so to speak. CVS simplified my Fall routine. They offered me an opportunity to get a “complimentary” flu shot, which turned out to be a great convenience. Because I have a history mitral valve problems, a flu shot is highly recommended and I take my health very seriously. 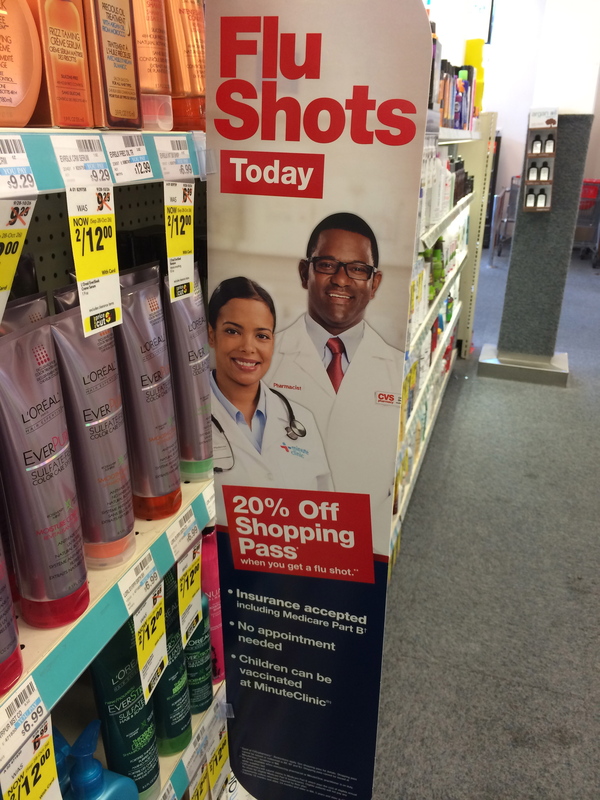 Upon arriving at a CVS, not too far from my home…I had to check in on the Minute Clinic computer in the waiting area. It was easy enough, but I could see, where it could be a problem for elderly folks, who may not have computer skills. Five chairs were available in the waiting area. This was a good sign…it meant that they do not anticipate lengthy wait times so no need for too many seats. My computer sign-in screen notified me, there were five people ahead of me…good information to share as it established a time frame. The nurse also told us, a few people were there only for flu shots and another nurse was expected back from lunch shortly, so the wait would not be too long. I breathed a sigh of relief, as I had to be at school pick-up in an hour. When it was my turn, the Nurse Practitioner reviewed the questions and answers from my computer profile. I signed my consent, got my vaccination, my receipt and was quickly on my way to school pick-up. I was also given a 20% off coupon for CVS, which I will use on another visit. 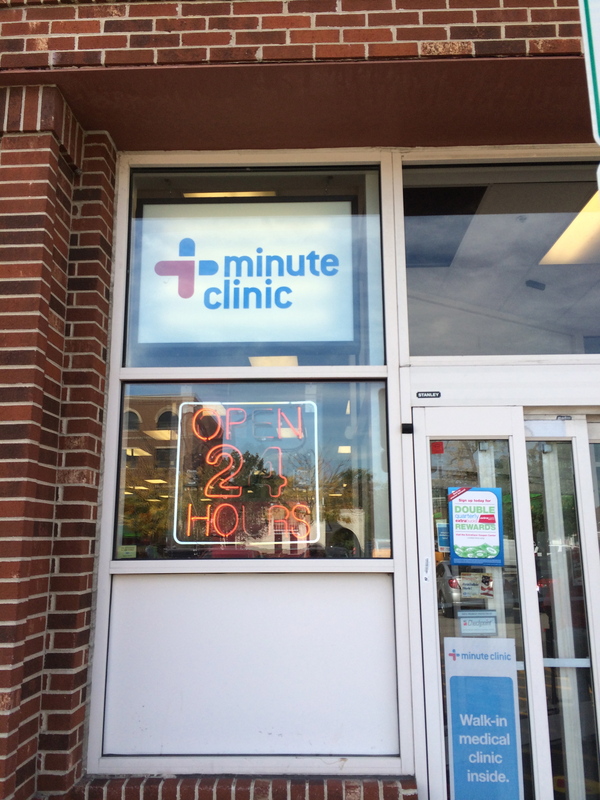 The real measure of a successful experience is whether or not I would feel comfortable coming to a Minute Clinic for medical care in the future ?… the answer…without reservation, YES. Would I recommend getting a flu shot this year?..YES…for sure. 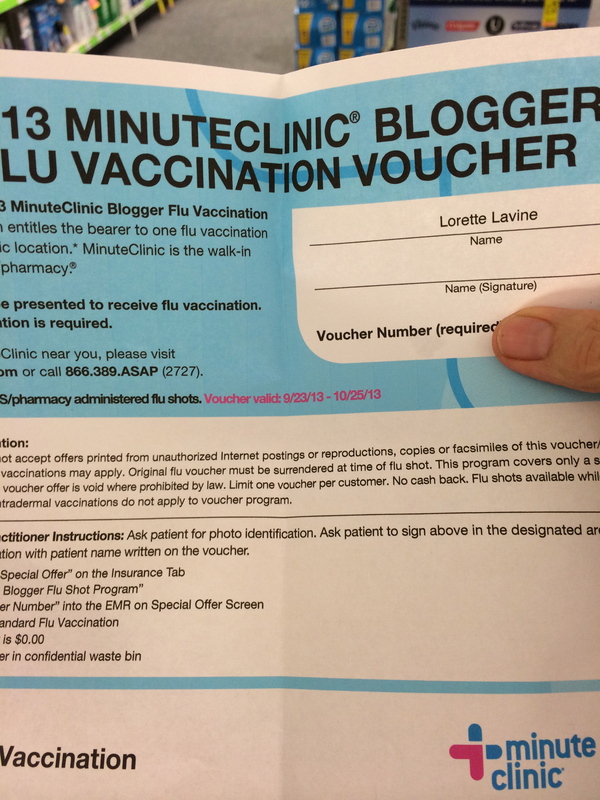 I was given a “free” flu shot from Minute Clinic…all opinions are my own as always. 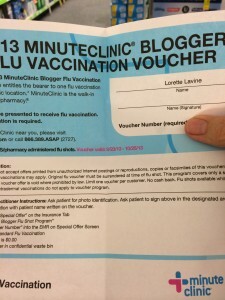 This entry was posted in Family, Grandmas & Grandpas, Moms & Dads and tagged CVS Minute Clinic, Flu Season, Flu shots by llpitlwp. Bookmark the permalink.